Spoiler warning: the following article contains spoilers for both Gravity Rush and Gravity Rush 2. On December 1, 2018, SIE Japan Studio held a JAPAN Studio “Fun” Meeting 2018 event in commemoration for their catalogue of games. 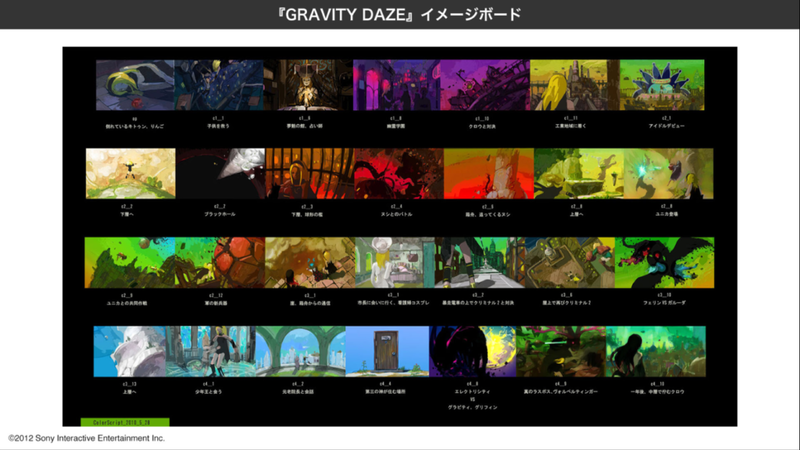 For fans who applied and were selected to attend the event, they were given QR codes to download images—including concept art—of SIE games, including Gravity Rush. Thankfully, Twitter user @dusty2978 who attended the event was generous enough to share these with Gravity Rush Central (SIE Japan Studio gave the fans at the event permission to share the images online). 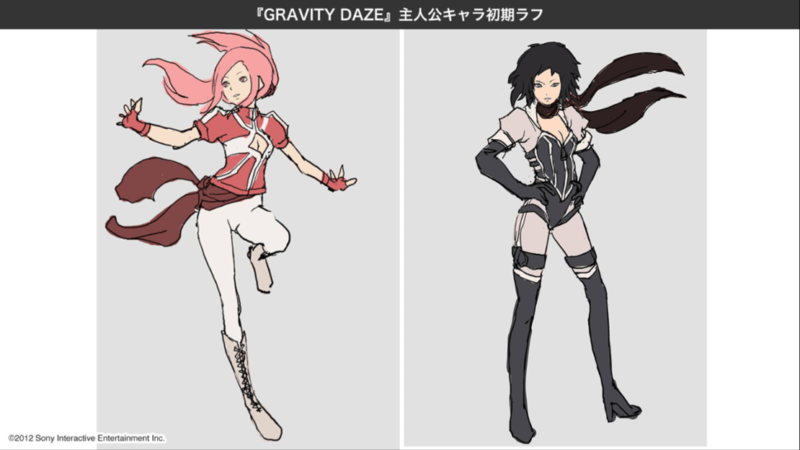 Many of the images provided—such as the concept designs for Kat and Raven—have already been seen by a number of Gravity Rush fans over the years, having been available either in the gallery provided in the release for Gravity Rush Remastered for the PS4, or in the official guidebook for Gravity Rush for the Vita in Japan. 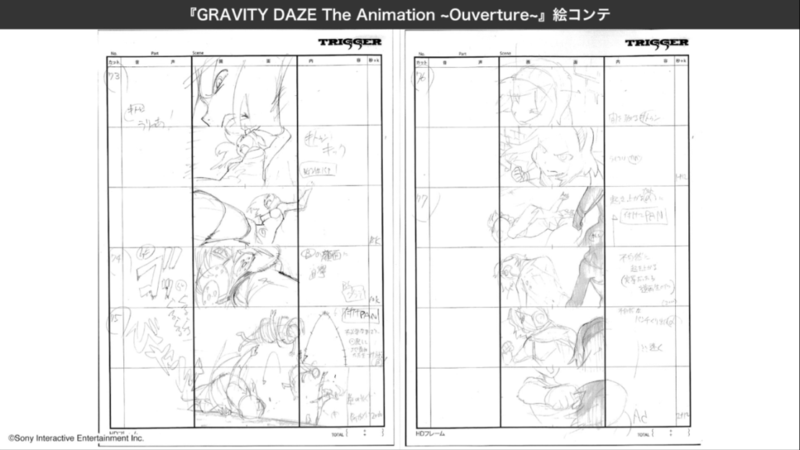 Even a couple storyboards featured from the Overture Animation by Studio Gainax have been made available. There are, however, a few pieces of art that have never been seen before. 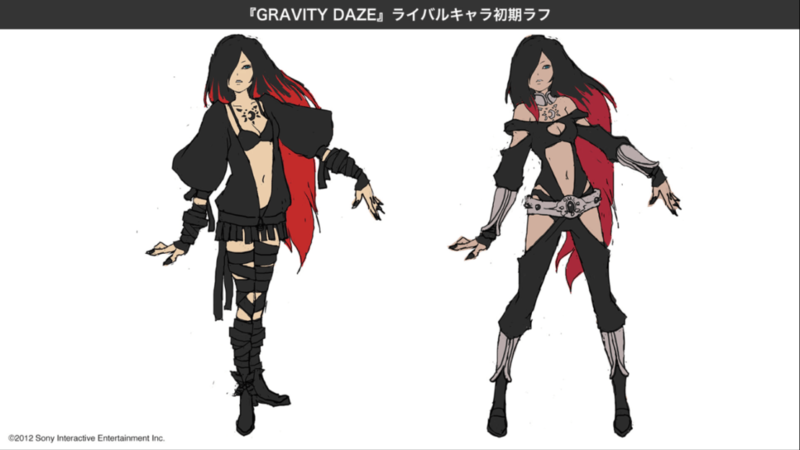 These images provide some insight into what Gravity Rush had once been when the developers planned for it to be just one game. 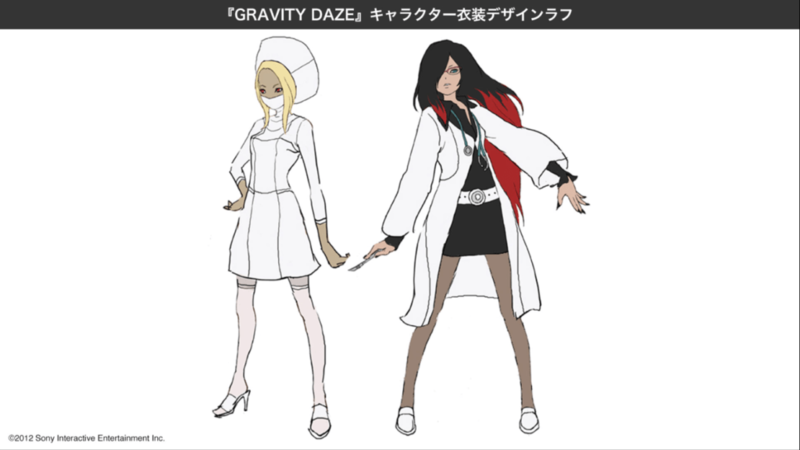 Fans who’ve played through the side missions of Gravity Rush 2 are likely to see the resemblance with a certain “battle nurse” outfit from the sequel. There are a few design differences, but Kat’s costume as a whole resembles the one used in two side missions from GR2. The other, more surprising reveal is Raven in a matching doctor’s outfit. On its own, the image makes it clear that the concept of Kat in a “battle nurse” outfit existed prior to GR2. The concept went through some design changes, and Raven’s doctor design and role was omitted in the sequel. But just what were the developers’ original plans for the Shifters with these costumes? What’s striking about these drawings is both the similarities and key differences between this draft of GR’s story and the end results spread across two games. We see the beginning with Kat’s arrival in Hekseville and her adventure through the city going through the same beats. She rescues a young child (Eugie), encounters a fortune teller (Aki), meets students in Pleajeune, fights against Raven, travels to Endestria, descends down to Boutoume to encounter the lost children, returns to Hekseville, fights the Sea Anemone, and considers the state of things with Raven and Cyanea at the end of these events. Likewise, she ascends to Eto as she does in the second game, encounters a child king (Cai) and an elderly adviser (Xicero), then returns back down to Hekseville to fight Elektricitie, the Rising Darkness, with the final episode centering on Raven overseeing the city. Yet, even before considering the most overt changes and omissions, there are a number of differences to consider here. 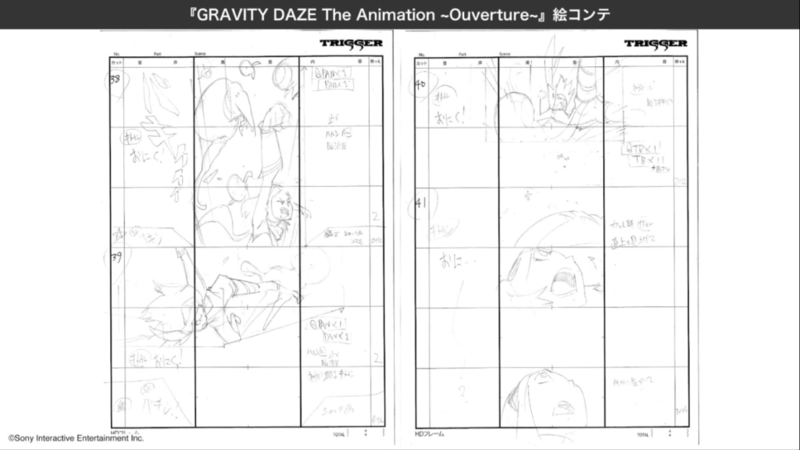 These include minuscule revisions, such as Aki’s beta design being much more ornate compared to her final one in GR1 (and without Pandora, it seems). The nurse outfit from GR2 was likely not the only outfit initially conceived of early on; the beginning of chapter two (the final drawing in the top row) involves an “idol debut,” almost certainly a reference to the Poterie Doll side missions fans should be quite familiar with. (That Kat is on a stage may have been an earlier version of her eventual performance on the Bismalia in Gravity Rush 2.) By no coincidence, the character design for the manager NPC existed at least as early as 2010. The differences become even more stark as the plot goes along. Most of chapter three has been altered or removed from both games. It is here where we see Kat donning the nurse outfit in her visit with the mayor (third row, fourth image from the left). Given the character designs above, this is almost assuredly Kat visiting D’Nelica, with some type of assistance provided by Raven, likely in an attempt to gain more information from him. What follows is less clear. Kat faces another confrontation immediately afterwards, this time on a moving train. It’s difficult to say just who she’s facing, as little can be made of the character. If it is not Syd/Alias—neither his current nor concept designs seem to quite match what’s seen in the picture, and he’s not featured elsewhere in the storyboards—then this may be a new character entirely. One possibility is that this could have been an Angel enemy. In a seminar held in March of 2017, Shunsuke Saito mentioned that Kali and Durga Angel were originally conceived of in the first game, except as one character. So Kali, as she was originally conceived, likely fought Kat here—although her role and backstory in the plot was likely to be quite different, given that Cecie/Durga did not exist yet, and Brahman may have been entirely absent. Going on, Kat also finds herself in two high stakes encounters in later episodes of chapter three. The first is a battle with Yunica, and the second is yet another fight with Raven. If the image of the latter were not clear enough, the text states that this is a battle versus “Garuda,” which is the name of the form given in the official Japanese art book for the super powered state that Raven obtains with Xii in GR2. We can only speculate what the two are fighting over, and why. While there is a lot to dissect from all of this, personally, the two elements that stand out the most to me are how Yunica’s and Raven’s respective roles changed from this draft of the story to the one we see in both games. Art of the first game presents Yunica on almost equal footing with the Shifters in terms of relevance and presence to the plot,and her involvement in these storyboards seems to bear that out. Yet her screen time was later reduced to only the second half of what was once chapter two. While she does appear in GR2, her character goes through brief and similar beats to her arc in the first game, and she is given nothing more than a cameo in the final chapter. This is unfortunate, as the games’ director and creator, Keiichiro Toyama, had previously mentioned in an interview with Gravity Rush Central that he would have liked to have expanded on Yunica’s (and Permet’s) story. 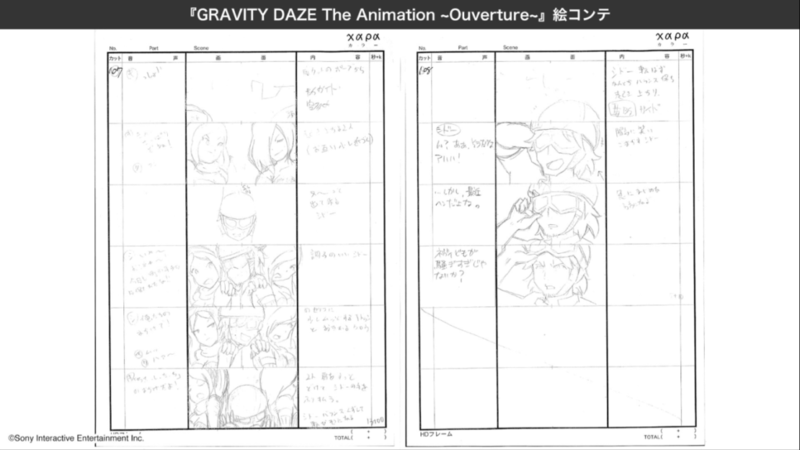 Meanwhile, Raven’s character arc and her relationship with Kat seems to have changed the most drastically between what we see in these storyboards to the finished product. It’s obvious that her development was revised a good deal with the additions in GR2, but the storyboard makes this more pronounced. While it is safe to assume that the Boutoume and Sea Anemone plots have similar results, and there is likely mutual cooperation concerning Kat’s visit to D’Nelica, seeing the two fighting each other yet again and her apparent absence in Eto—much less the obvious absence of interactions the two have in the sequel—points towards an appreciably less amicable relationship with Kat. This is a very different one compared to the closer relationship we see the two develop in Overture and in GR2. 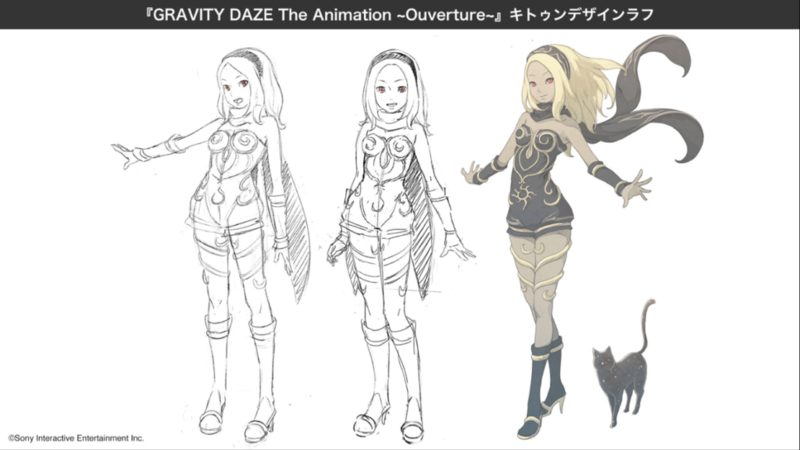 Fans will, understandably, never get the full picture of all of the changes that the story and characters in the Gravity Rush series underwent during its decade long development. But these images have managed to give us a fascinating glimpse into that process, and just enough to speculate on the changes made from an earlier draft of the plot to the incredible games we have today. 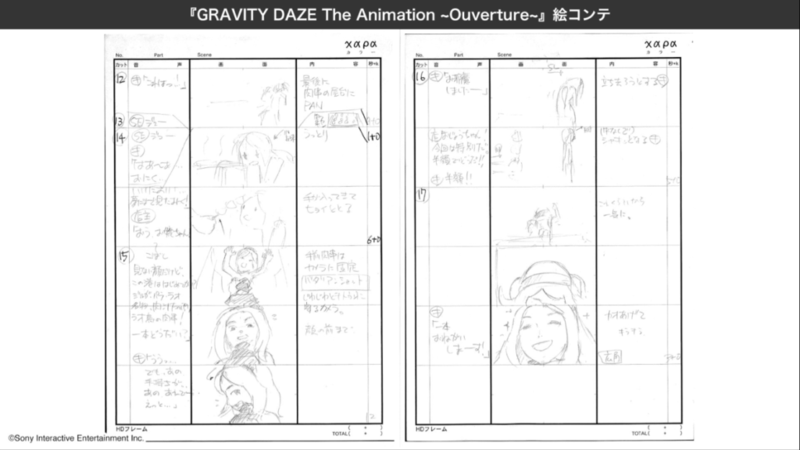 The table below shows the English translations for the Japanese chapter names shown in the Gravity Rush storyboard. Previous PostAfter Gravity Rush 2, We now Also Know the Total Player Count for Gravity Rush Remastered! Next PostKat is Featured in the New International Women’s Day 2019 PS4 Theme! Fascinating, insight. Thanks for the scoop!